Bluebird Cheezels are a puffed corn snack, packed full of cheesey flavour. This 120g bag can cure the biggest craving for a snack. Bluebird are proudly kiwi and proud of their Cheezels. Corn, Palm Oil, Whey Powder (Milk), Tapioca Starch, Salt, Cheese Powder (Milk), Flavour Enhancer (E621), Mineral Salt (Potassium Chloride), Hydrolysed Vegetable Protein (Soy), Rice Bran, Sugar, Emulsifier (E471), Yeast Extract, Colour (E160e), Food Acids (Lactic Acid, Calcium Lactate, Ascorbic Acid, Citric Acid), Flavours. Buying loads of these for my dad this Christmas as my aunt sends us these from time to time and he LOVES them very happy I found them :) they are so nice! Only the best! 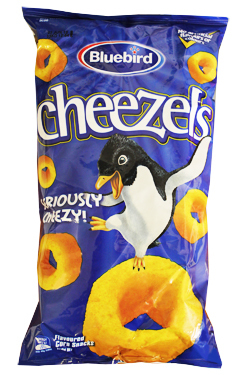 As a Kiwi ex-pat, I thrive on the treats I get on here and Cheezels have no rival in the UK. Sorry Wotsits! Being English I have always been used to Wotsits but having eaten Cheezels in NZ I became addicted to them and have been ordering them from here ever since, Wotsits don't quite live up to the taste!